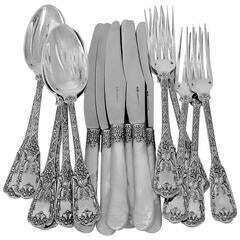 Exquisite Dinner size Spatours by Christofle France silver plated flatware set, 40 pieces. Great starter set! 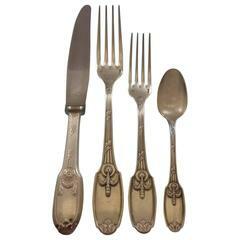 This set includes: Six dinner size knives, 9 3/4" Six large dinner forks, 8 1/8" Six dessert knives, 7 5/8" Six dessert forks, 6 3/4" Six small teaspoons, 5 1/4" Six large dinner spoons, 8 1/8" One serving spoon, large, 10" One serving fork, large, 10" One roast carving set, two-pc, 12 3/4" & 11 1/4" Includes bonus brand new storage chest. Excellent condition, with no monograms. Minor surface scratches, as expected with age. This set will be lightly professionally polished prior to shipping. Stunning! 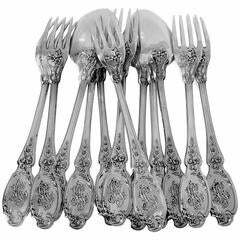 About Christofle: Established in 1830, Christofle created silverware for French royalty, including King Louis-Phillipe and Emperor Napoleon III. 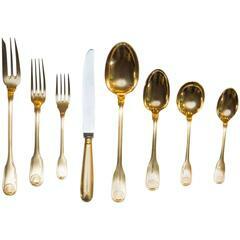 Each piece is proportionally balanced and hand finished for unsurpassed beauty?and designed for everyday use. 100% satisfaction guaranteed!